The French agency for the quality of construction, AQC, published an interesting guidebook on the restoration of traditional earth buildings. For French speakers and other fans of earth building you can download it for free from the AQC website with the link in the text below. Or otherwise by clicking here. Cofinancée par la DHUP et l’AQC, cette étude met en exergue les principaux points de vigilance de la construction et de la réhabilitation en terre crue. Elle aborde trois techniques porteuses (l’adobe et brique de terre crue, la bauge et le pisé), deux techniques non porteuses ( la terre-paille et le torchis) et les enduits de terre crue. Elle s’inscrit dans les travaux d’élaboration de six guides de bonnes pratiques recouvrant les 6 techniques évoquées, soutenus par la DHUP. 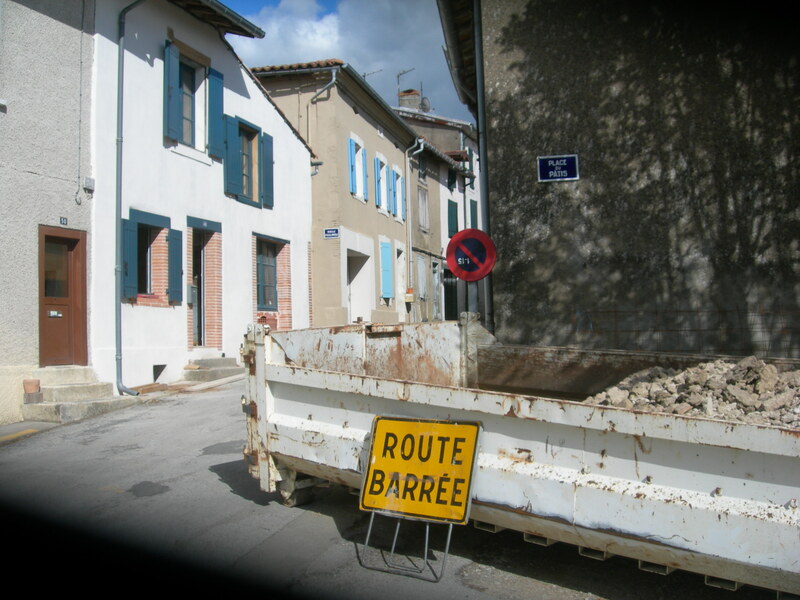 The project for the French resource centre on ‘responsible’ retrofit of traditional buildings, CREBA, has started with two consortium meetings this year in Strasbourg and Bordeaux. At the June conference of the national Building Quality Agency AQC in Paris one of the project partners will present the CREBA project and brochure to a wider audience. In the meantime, together with the STBA, the School of Architecture in Toulouse is working on the French translation and adaptation of the Guidance Wheel. Other partners have started gathering references and examples of best practice in retro-fitting to supply the future resource centre. Another presentation will be given at the annual congress of the heritage organisation Sites et Cites Remarquables de France in Calais in September. The French ministry programme PACTE has awarded the project CREBA with a two year subsidy. This will allow us to develop a national resource centre on ‘responsible’ renovation of traditional buildings, built before 1948. The future website will contain the latest publications, guide books, scientific references and reports on sustainable renovation. It will also provide case studies and ‘decision making’ tools for house owners, architects, developers and builders. It will host the French version of the Guidance Wheel developed by the British STBA. Members of the project consortium are CEREMA in Strasbourg, the School of Architecture in Toulouse, Arts et Metiers in Paris, Maisons Paysannes, and the heritage organisation Sites et Cites remarquables. The official announcement of the project was made at the European Biennale of Urban Heritage, the 4th of November, during the symposium on Historic Town Centres in Cahors. Finally getting onto the finishing work on the front of the house on the street side and in the alleyway. 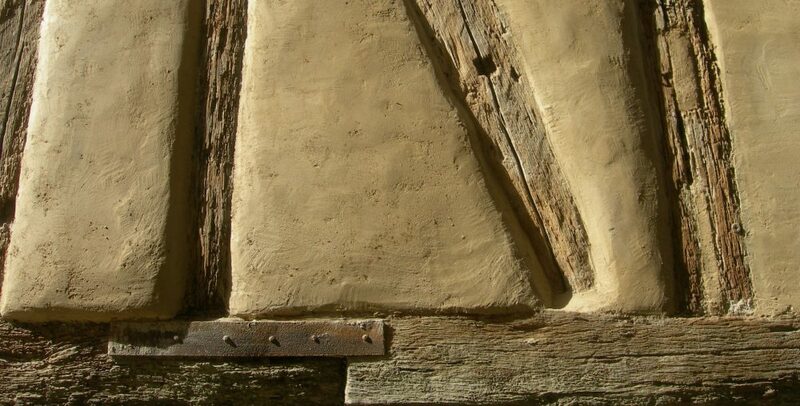 All the interior timber and wattle and daub walls have been restored with a light mix of lime and flax (straw). This was followed by a last coat of lime plaster for which I used air lime (CAEB) and two types of sand (sable calcaire) from a local lime stone quarry, giving it either a nice creamy, or ochre coloured finish, which matches the colour of the original daub. The other walls have just had a whitewash finish directly onto the lime and flax render. 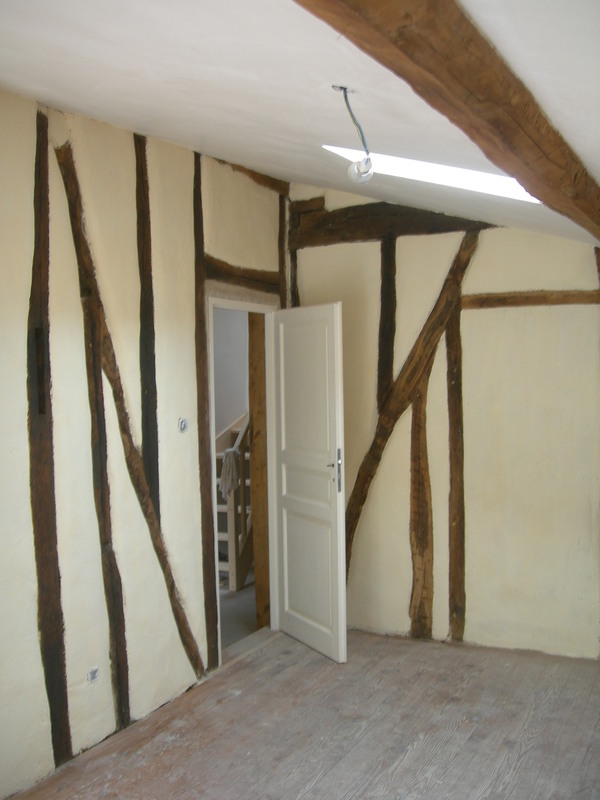 The last big project was the restoration of the timber frame facade in the alleyway. 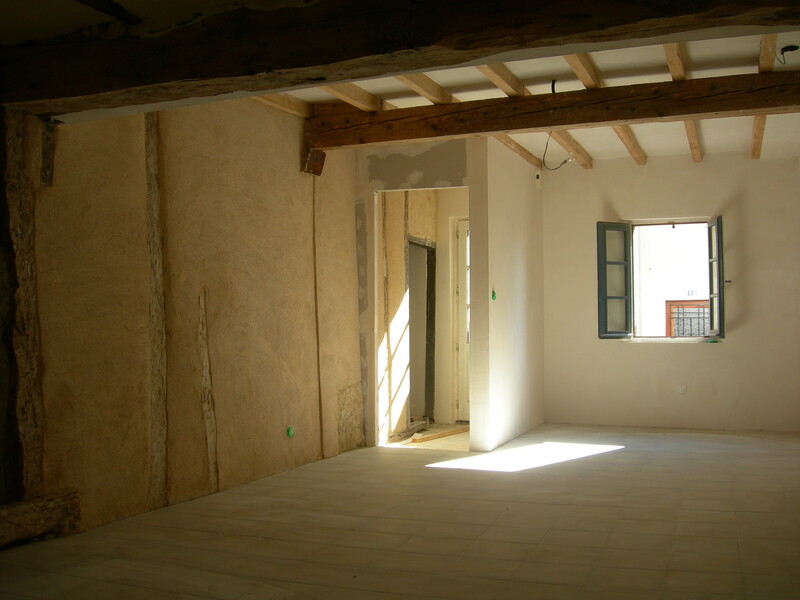 The top floor had already been restored in 2008, with a whole new infill of ‘fresh’ daub made from old walls to which I added some sand and straw. The old daub panels on the first floor were in bad shape and still needed repair. This time I didn’t use new daub but chose a more commonly used traditional technique, filling the bigger holes with a mix of lime mortar and bits of old terra cotta tiles. The main advantage being the shorter drying time – daub takes a few months to dry. 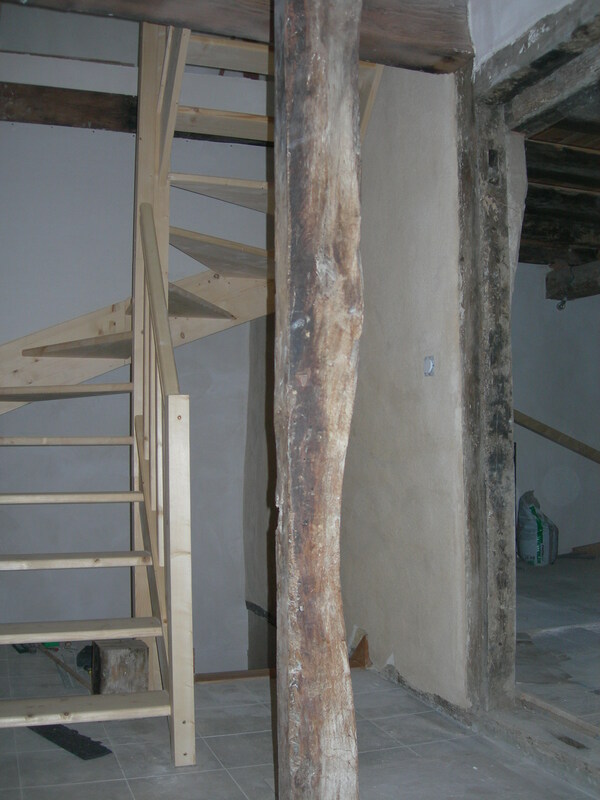 I used a special hydraulic lime (Boehm NHL-2) which is not too strong and compatible with vernacular materials. This lime has definitely air lime qualities and the mortar doesn’t set immediately if kept overnight under a film of water, making it still usable the next day. The infill was followed by a first coat of lime render (corps d’enduit) to which I added some flax straw (horse bedding) to stop it from cracking. For the finishing layer I used an earth plaster made from crushed old daub, sieved at 2 mm, to which I added an ochre coloured quarry sand, also sieved at 2 mm, and a little bit of lime (about 20% of NHL-2). The render was applied with a plaster knife and then worked by trowel to get a smooth finish, which the French call a finition serré (‘tight’ finish). We took a bit of a winter break after more than a year of renovation. It’s now only a matter of painting and finishing, to get the front of the house ready. For the interior daub walls we use natural lime wash, with alum salt to stop it flaking and a bit of clay pigment for colouring. For the interior windows and doors we use linseed oil, or eco paints (Aquamarijn and Biopin) and hard oils for the staircases and pine floors. The fitted kitchen is made of solid birch panelling (not on photo yet). As you can see on the photo above, the work on the front of the house has progressed tremendously in the last half year. October last year the local manufacturer Consola replaced all doors and windows with new double glazed ones made from local chestnut. This spring the whole roof and all walls and floors were insulated, mostly with Isocell cellulose (22 cm for the roof, 14 cm for the walls) and perlite and cork for the floors (6 cm). 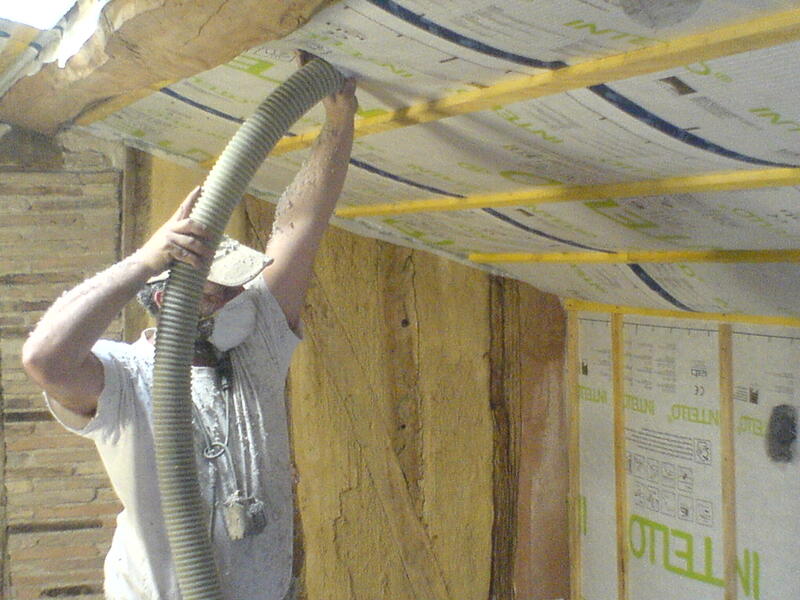 The cellulose insulation comes from a nearby factory in Beziers in l’Herault which uses locally recycled newspapers. 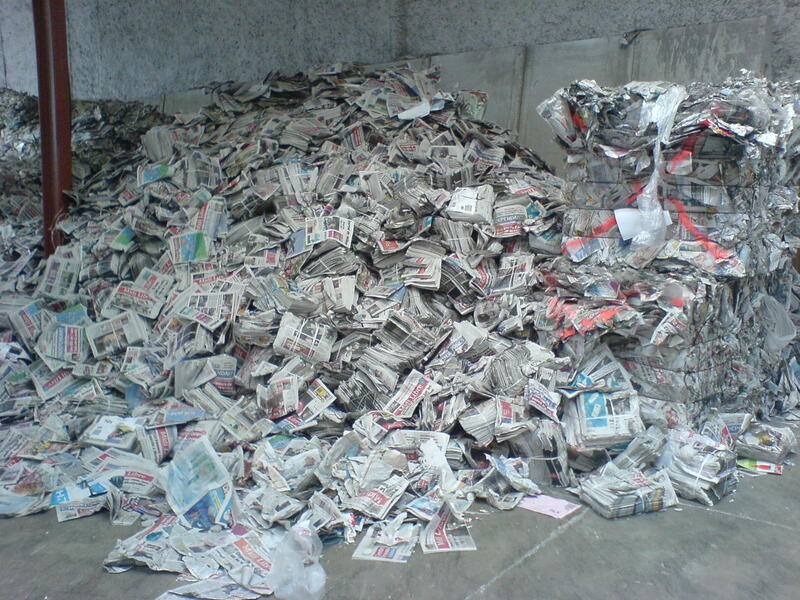 As a former environmental journalist it suits me well to have our walls filled with the scraps of the old Languedoc papers Midi-Libre and l’Independant (photo), especially since we were able to inject them behind intelligent and breathable membranes. The whole building envelope is now very well insulated and made airtight with Intello Plus vapour barriers of Pro Clima, who sell you a whole kit with different tapes, glues and a hefty instruction manual. Not to our surprise it was a lot of preparation to make the ‘compartments’ and put up the membranes before having the cellulose blown in. One wall was too humid and had to be insulated with Amorim cork boards (2 x 4 cm overlapping). Another wall, which is partly sunk into the ground and suffers from rising damp, was insulated with cork chips behind impermeable plasterboard. Indoor walls that adjoin the neighbors’ were insulated acoustically with 10 cm of cellulose and a double layer of plasterboard. The perlite-crete floor in the big living kitchen was poured onto OSB waterproof boards (19 mm). Unfortunately the massive, old oak floor beams which carried the four-inch dirt floor laid with terracotta tiles were too warped to be leveled. We replaced them with new untreated Douglas-fir floor joists from the local sawmill that gets its wood from the nearby Black Mountains. 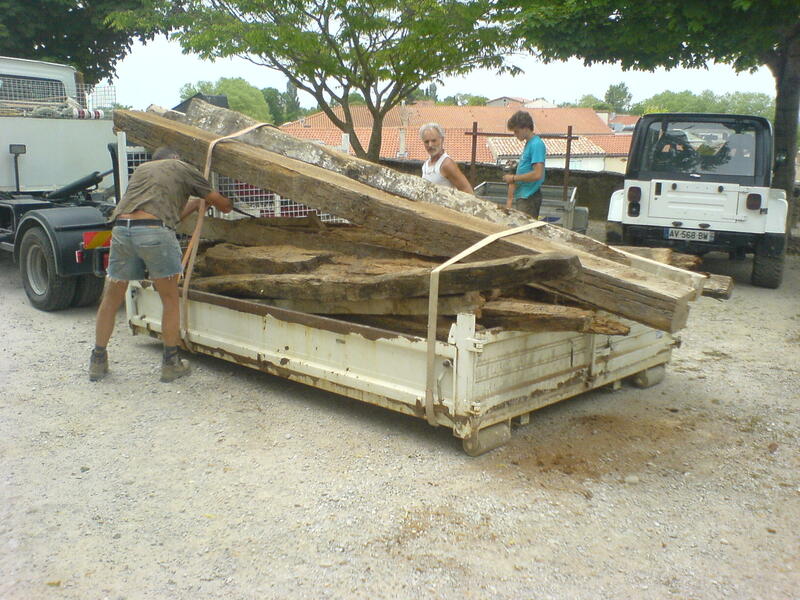 The old oak beams were sold to a builder in the nearby village of Lautrec, which paid for the new floor (see photos). Good news is that we received a state grant for the insulation of the rest of the house. It’s part of the government scheme Habiter Mieux (ANAH) for which we applied last year. A lot of paper work but well worth it as the French state finances a good part of the insulation work. This grant also made it possible to put in new doors, windows and shutters: double glazing in local chestnut which we will paint with traditional linseed based paint.The roof and exterior walls are going to be filled with blown cellulose insulation (Isocell) behind a breathable membrane (Pro Clima). 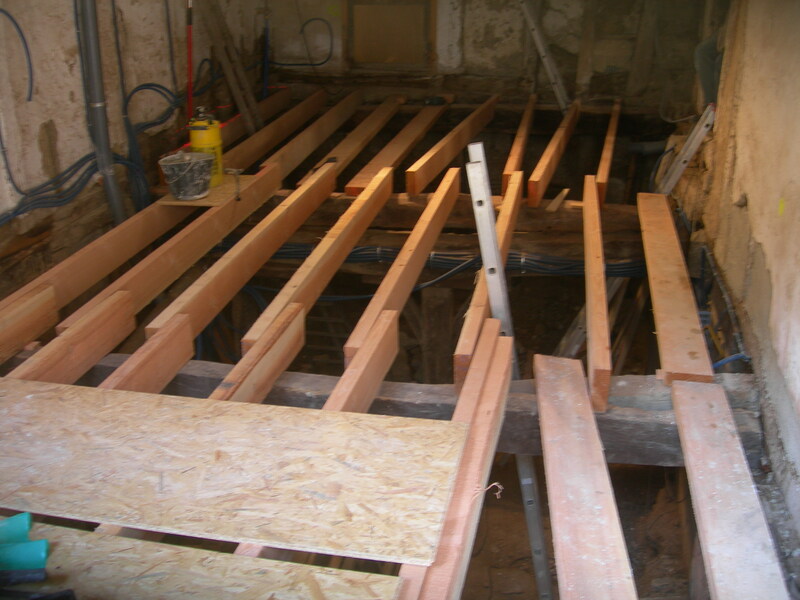 Floors will be made from French pine (pin des landes) and Portugese ceramic tiles and staircases from pine and beech. The facade will be rendered with lime. 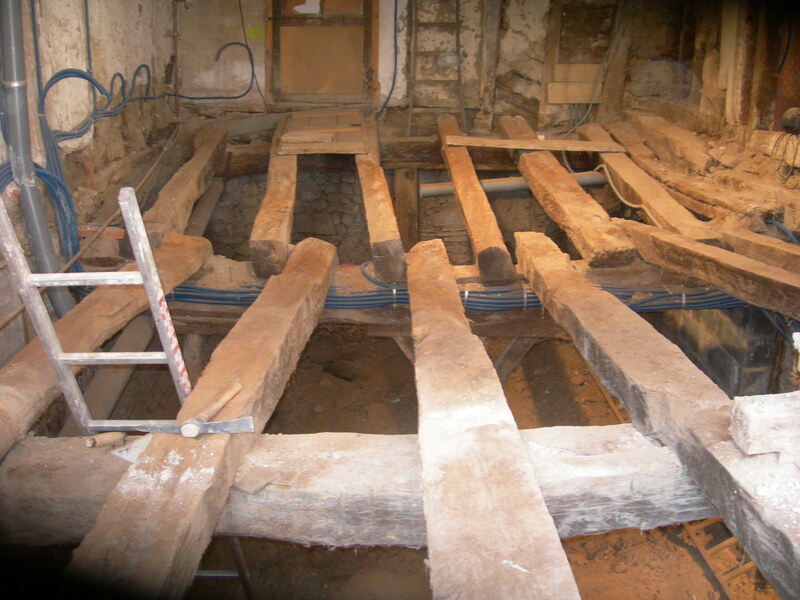 Altogether a big step forward in the ongoing eco-renovation of our 17th century timber frame village house. This autumn we will post some photos of the work. Hans Valkhoff is a researcher, journalist and environmentalist. 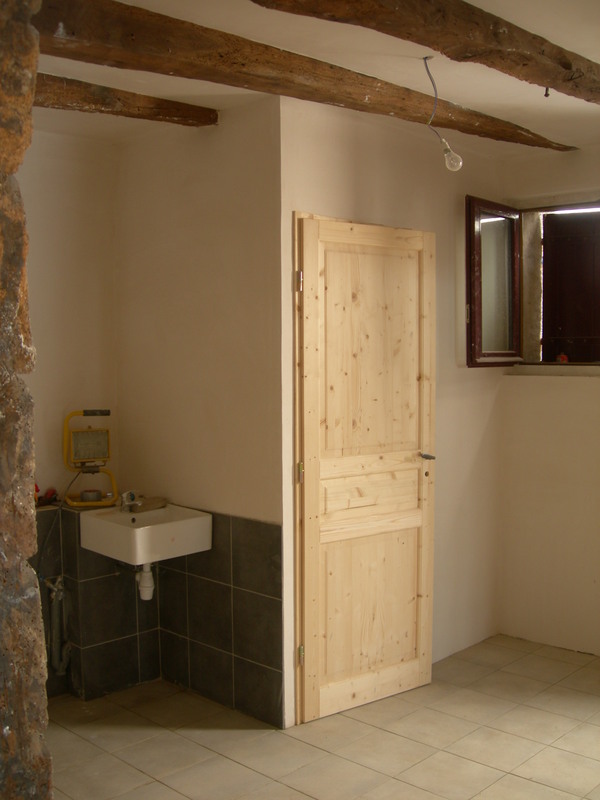 He specialises in ecobuilding and restoration and lives and works in the Netherlands.